No matter the season, you depend on your HVAC unit to keep your home comfortable. When you need repairs or replacements, you want to choose a company that is experienced and familiar with your local area. That’s where Practical Systems and Ductworks comes in. For over fifteen years, our company has served the greater Twin Cities area. As Daikin Certified Comfort Pros, we utilize the best equipment in the industry. All of our products are eco-friendly and energy-efficient which reduces your need for gas and electricity. Whether you need a brand new unit installed or you need your older model serviced, our NATE-certified technicians will work to keep them working as effectively as possible, for as long as possible. 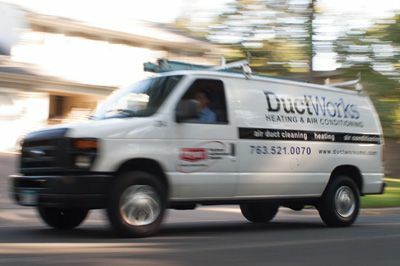 At Ductworks, we believe quality HVAC services shouldn’t cost an arm and a leg. That’s why we provide all of our customers with A-list products, and comprehensive services. Our team of licensed and bonded technicians is committed to making your home comfortable no matter the season. You can tell a lot about a company by its awards and affiliations. Ductworks has had an A+ rating from the Better Business Bureau since 2006. In 2017, we earned the coveted Angie’s List Super Service award, which recognizes excellent service throughout a calendar year. We are also NATE (North American Technician Excellence) certified. This nationwide certification program for HVAC/R technicians verifies that those certified are the best in the industry. If, for any reason, the Daikin Comfort Professional has not met your expectations within one year of your equipment or system installation, please contact the installing Daikin Comfort Pro and ask them to honor the Daikin Comfort Promise. The Daikin Comfort Pro will return to your house to resolve any issues that you have with your installation at no cost to you. As part of formally maintaining the Daikin Comfort Pro distinction, the Daikin Comfort Pro will make all reasonable efforts to resolve any concerns you have within one year of your equipment installation. If a Daikin Comfort Professional does not meet your expectations, they risk losing the ability to sell Daikin products. With the Daikin Comfort Promise, you can have peace of mind that your Daikin Comfort Professional will continue to earn your business well after the sale. If not, they cannot be a Daikin Certified Professional. Period.